Here's a superb new online game from NextGen gaming. The unpredictability of slots, the luck of the Irish, and the expertise of NextGen Gaming is what Irish Eyes 2 offers. 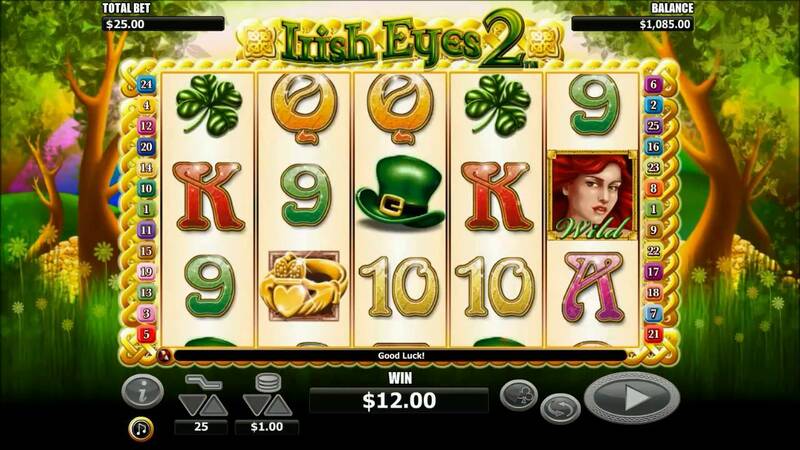 This new online slot game is an improved version of the original Irish Eyes. Although they have bid farewell to the leprechaun in the newer version, the game more than makes up for it with better sound effects, attractive graphics, quicker spins, and better returns. In other words, think lush forest, chipper birds, and of course great treasures! This online casino game has five reels and 25 play lines. It is easy to navigate and offers up to 20 free spins along with a Gamble Feature – where you can multiply your winnings by up to 4 times. Other top casino promotions include the Wild and Scatter symbols. The top-rated slots is also designed for players of varying levels hence allowing you to tailor individual spins to your budget. However big or small your investment, this online slot game encourages you to embrace the Luck’ O the Irish! NextGen Gaming produces both online and land-based casino games, and also serves lotteries and gaming operators. Despite being one of the pioneers of online casino games development, their name does not always appear with the other slot game giants. That is because they tend to integrate with other prominent software providers and developers, and distribute their casino games under their partners’ profiles. As they are equipped with both an engineering and a software department, they are able to monitor these integrations closely, without compromising on user experience. In fact, they often incorporate personal touches for their users like allowing for manual placement of Wild symbols in slot games. So although you do not come across their name as frequently as others, don’t be mistaken because they truly are the Next Generation of Gaming – propelling the industry with their technology and innovations. The Irish superstitions on wealth and luck have travelled through time and distance – with rooted beliefs from the past, and recognisable symbols that journey around the globe. NextGen Gaming builds precisely on that premise to produce the online slots game: Irish Eyes 2. Bringing together the concept of Irish Luck Money with a Slot Game is as satisfying a pair as Fish & Chips. The emerald isle is aptly portrayed in the background of the slot game with a green countryside. It is further speckled with details like daintily fluttering butterflies, flowers gently swaying in the wind, lush trees, and a subtle rainbow. The spinning reels are bordered with a gold Celtic frame, and every so often you get a wink from green Irish eyes. This slot game manages to bring forth the idea of traditional Ireland not just visually but also aurally – with buoyant Irish folk music accompanying every spin, while the birds twitter in the Irish meadow to fill the pauses. 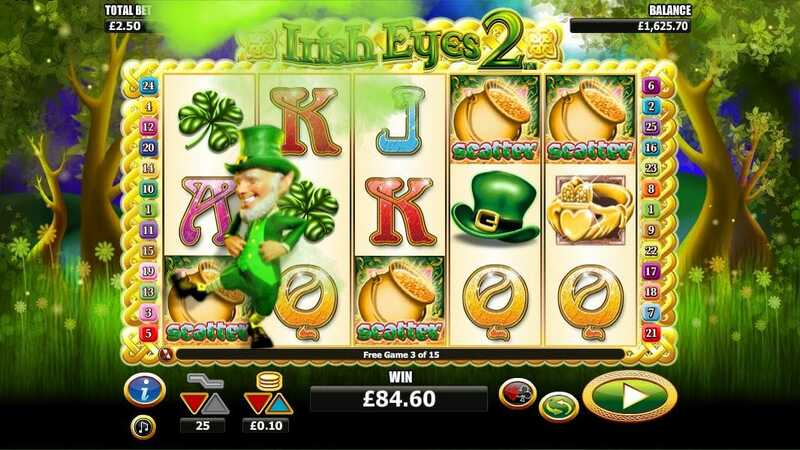 Irish Eyes 2 is a 5 reel, 25 pay line slot game with a simple objective. You have to achieve a winning combination of symbols. The high value symbols – keeping true to the nature if the slot game – are fashioned around everything Irish: Shamrock, Pipe, Green Hat, and a Lucky Claddagh Ring. The Wild and Scatter symbols are also thematically consistent, depicted (respectively) by a saucy redhead, and the famed Pot of Gold. The lower value symbols are between the conventional range of Nine to Ace: 9, 10, Jack, Queen, King, Ace. This online casino game also offers WILDS and Bonus Features. After all, it wouldn’t be a game of Luck and Slots without them! Below is an outline of what Irish Eyes 2 offers and their respective functions. This is depicted by a fiery haired woman with an Irish (Eye) Wink. She can substitute almost every symbol to form a winning combination. The only exception to this rule is the Scatter Symbol (Pot of Gold) which she can’t replace. Depending on the frequency of her appearance, you can expect to see a growing reward and if Luck favours you, you could clench up to 5000 coins! Represented by a Pot of Gold, this symbol prompts the Free Spins Bonus. The number of Free Spins directly corresponds to the number of Scatters (Pots of Gold) presented on the reels. This bonus is triggered by the Scatter Symbols (above). Not only are these Free Games, the wins acquired during these bonus rounds are tripled! To make this bonus feature even sweeter, depending on your luck, you can also re-trigger the Free Spins. There is plenty to be won in these rounds so keep your eyes glued for these famed Pots of Gold! If you are feeling particularly swanky, you could give the Gamble Feature a go. The optional feature appears when you land a winning combination. You can then choose to gamble on the hidden card, predicting either its Colour or Suit. Your winnings are doubled if you’ve selected the correct Colour, and quadrupled for the correct Suit. These winnings could be gambled up to 5 times in total but – before you decide to push your luck further – you could very well end up losing your wins with the wrong selection, so do tread carefully. 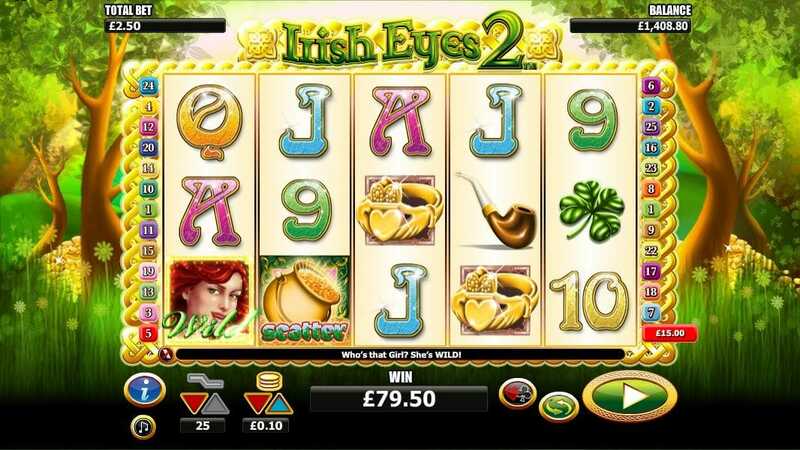 Irish Eyes 2 presents an online slot game with a cultural twist – from Irish folk music to themed Irish icons. The slot game has also improved from its earlier version (Irish Eyes Slot Game) with not just technical advancements, such as better graphics and background sounds, but also more lucrative bonus features like additional free spins. So for any Irish-loving slot gamers, this one is certainly for you: May your pockets be heavy and your heart be light; May good luck pursue you each morning and night! If you enjoyed then you might also like Sugar Train Xmas.